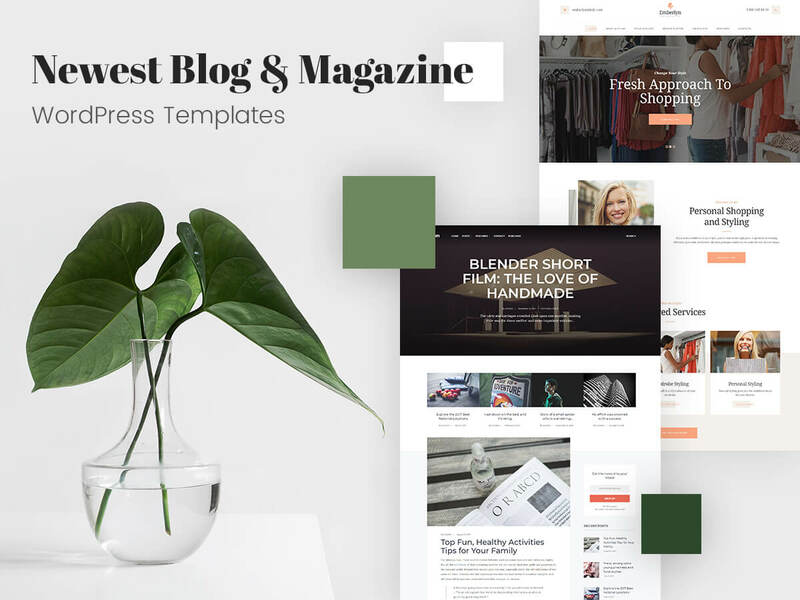 We’ve prepared a collection of hand-picked blog and magazine WordPress themes designed with style, trends and your ever-evolving needs in mind. You can select them for travel, food, lifestyle, fashion, sports, or any other subject-oriented blog you’d like to run. Share your thoughts and impressions with your followers and build your own community of friends connected by their interests. 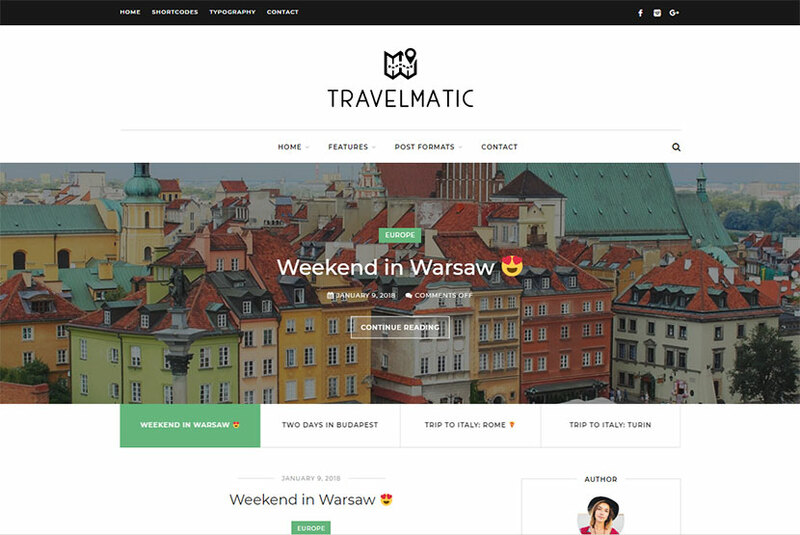 A travel blog WordPress theme which you can use as your travel diary to share the photos and stories of all the places you’ve visited as well as find new friends and followers. As the theme comes with superb design and typography, you can use it to stand out from the crowd. The template is fully integrated with Google Maps, so you can display the places you’ve been to on the map in your every blog post. You can create detailed maps full of markers, lines to highlight roads and polygons to show areas. Everything can be easily created via map creator in post editor. Social media integration, KML support, slider for page templates, and many more features are also included. A new WordPress theme suited for any kind of news website, magazine, viral blog or any other personal website. It comes packed with features and has a lot of customization options in Live Customizer. You can use any of the 3 different homepages, a number of cool blog post layouts, custom widgets and shortcodes, etc. 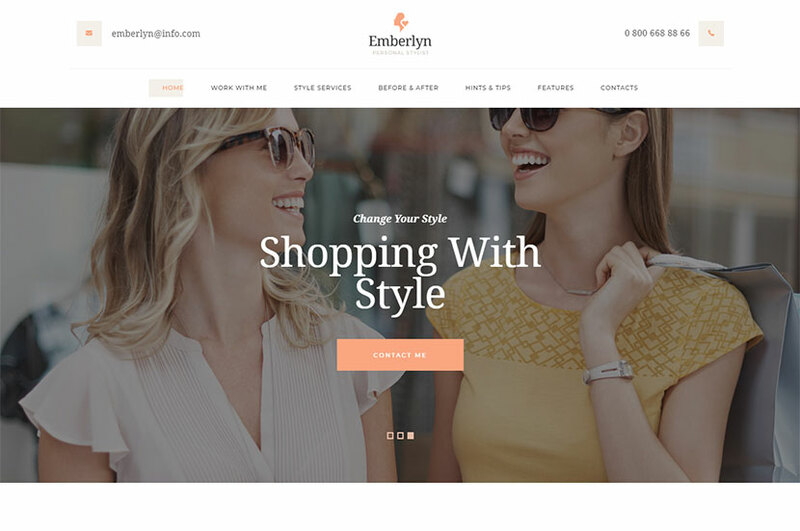 The template also boasts the compatibility with plugins like WPBakery page builder, Revolution Slider, Essential Grid, Mailchimp, and more solutions significant for its smooth work. It supports WooCommerce and includes the online store functionality. A clean and minimal WordPress theme perfect for blogs and magazines. It is also quite suitable for sports, photography or any storytelling website of your taste. Take this theme if you want to create a very easy to use and simple blogging website for your target readers. The template comes with more than 800 Google fonts, unlimited colors, widget-ready sidebars, WP Theme Customizer options, custom widgets, child theme support, valid HTML5, CSS3 and JQuery code, detailed documentation, social profile and sharing integration, and many more useful features that come in the pack. A professional magazine WordPress theme that you can use to build a news, newspaper, magazine, publishing or review site in a few minutes. It is designed thoughtfully and with attention to detail to meet your most varied requirements. The template supports 9 post types, predefined page layouts, advanced theme options, a lot of useful shortcodes, translation support, footer callout options, uploading a header image on homepage, call to action box in the header of homepage, 8 predefined sidebars and unlimited sidebars for pages, 12 predefined color schemes and unlimited color schemes to fit any brands, and many more features. A great WordPress theme which allows to share a story of your pregnancy, childbirth and parenting with your followers. This theme can be also useful for gynecologists, midwives and maternity nurses as well as other topic-related specialists. 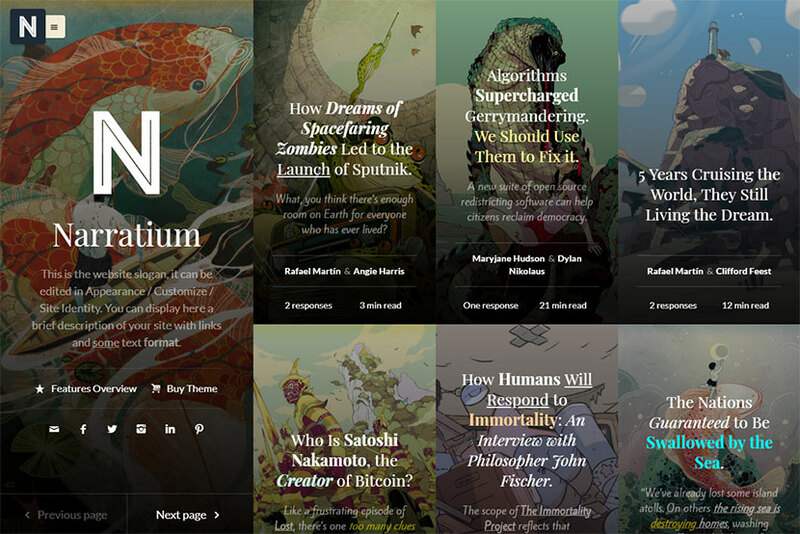 Pastel color scheme of this theme looks quite awesome. You can choose from different homepage layouts and blog steampage templates to create your online diary with simplicity. 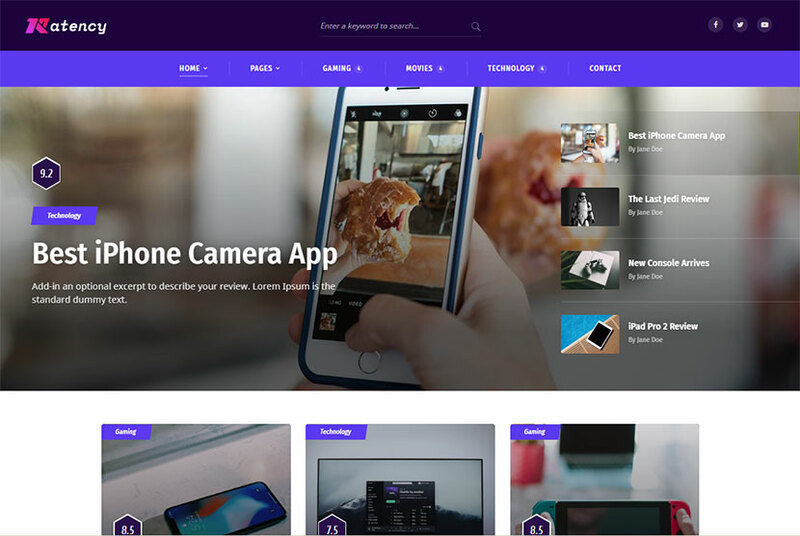 The template comes with professional design, interactive ajax search, Slider Revolution and Swiper Slider, WPBakery page builder to modify any page content, boxed and fullwidth layout, and many more features. A perfect WP theme for those who want to share their insight on fashion and personal style. If you are a personal shopper or stylist, a fashion designer, or any other related expert, this theme is exactly for you. 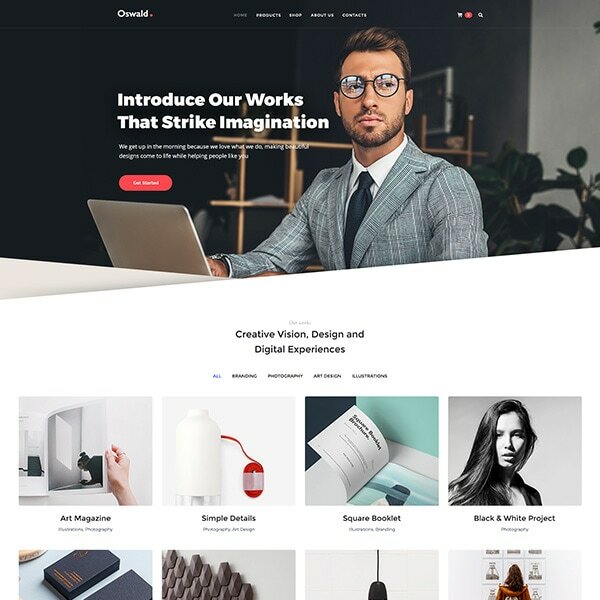 This amazing theme includes a lot of very useful features which will be very helpful for creating your online magazine without any programming skills. It comes with WPBakery drag-and-drop page builder which has the intuitive user interface which is easy to understand for everyone. It also comes with Slider Revolution and Swiper Slider integrated into it, a lot of layout features and blog settings, and a lot more advantages. A high-performance WordPress theme fully appropriate for any personal blog. It comes with two major featured sections and fully responsive layout. It also has multiple color schemes, custom widgets, and much more cool things in the pack. The theme is based on Redux framework and includes an advanced admin panel with options. Except for the featured slider, it comes with additional featured section which is the slider below. You will be able to select from 5 post formats, use main or custom menu, create a multilingual website, hide or show post elements in every single post, etc. A fully featured WordPress theme suitable for review and magazine websites. The theme comes with an advanced review system and drag-and-drop page builder included into it to allow for easier website building process. Boosted Elements Add-On is included into the theme to easily create sliders, maps, popups, and more elements for your website. It also has a premium slider to create presentations and slide shows using the built-in slider element. Unlimited colors, sticky header, mega menu, contact form, translation ready support, and many more features are also available. A clean and fast WordPress theme packed with all you require to set up a beautiful blog & photo gallery. It has a modern minimalist design which is made with attention to detail and which is simple to maintain. This template comes with full WooCommerce compatibility, so you get all e-store functionality which is needed to start selling online. The theme is powered by WP Customizer and comes with a lot of settings allowing to change its appearance and manner of work. You will find a number of different page layouts, post formats, category layouts, custom sidebar widgets, and many more features. A travel blog WordPress theme designed for you to share your story of international dwelling. You can also select this theme for a lifestyle blog, food, fashion, photography, or any other related online magazine or diary website. The template comes with a number of blog layouts, different header styles, widgetized footer and theme Customizer which allows you to personalize your website. By the way, you can choose from 6 homepage layouts, create a website with the help of a child theme included, use Contact Form 7 to keep in touch with your readers and subscribers, and use many more features for your purposes. 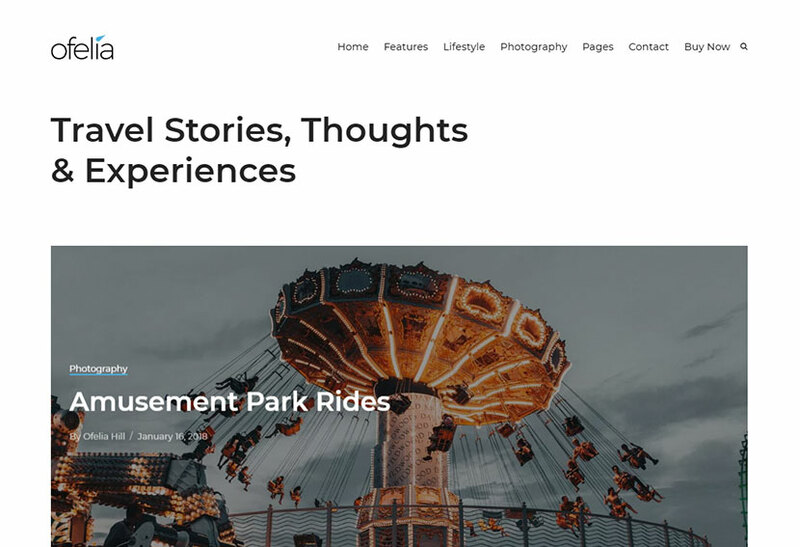 A beautiful WordPress blog theme for building personal, blog or magazine website devoted to fashion, travel journey, tour, lifestyle, food, etc. It has a modern, clean and elegant look as well as lots of customization options for bloggers. You will be able to play with plenty of customization styles, layouts and widgets that make your website natural at blogging. It has color options for a host of elements, 4 pre-made layouts for blog and category sections including list, grid, list-alternate and masonry, 6 post formats, a wide array of custom widgets, and many more peculiarities. A modern WordPress theme designed and built for writers and bloggers. It’s been created with simplicity in mind and includes a lot of configuration options and customization features. 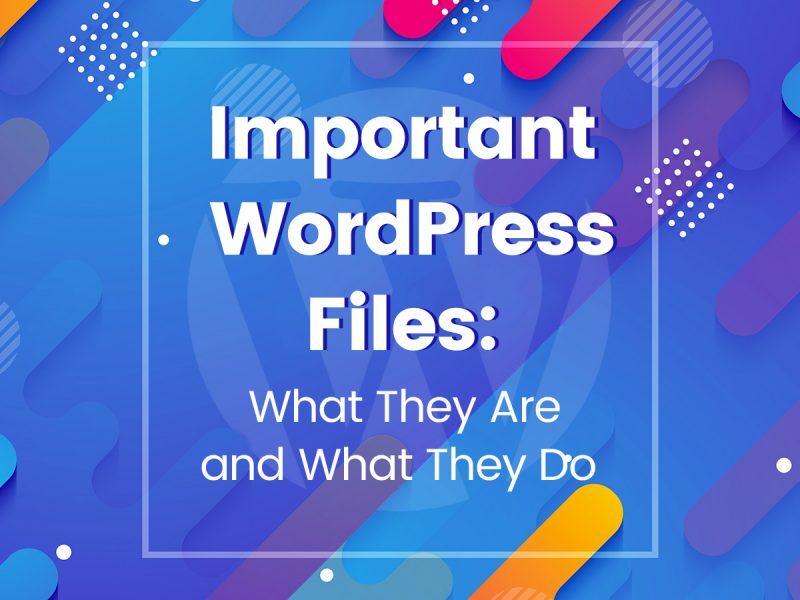 Use native WordPress functions to ease the management and build your website with no efforts even if you are a beginner and you’ve got no coding knowledge at all. The theme includes dynamic ajax navigation which can be activated with one click, text format tags for titles, extended template system, custom author avatar support, featured images for every category, and more features necessary for a cool blogging site. 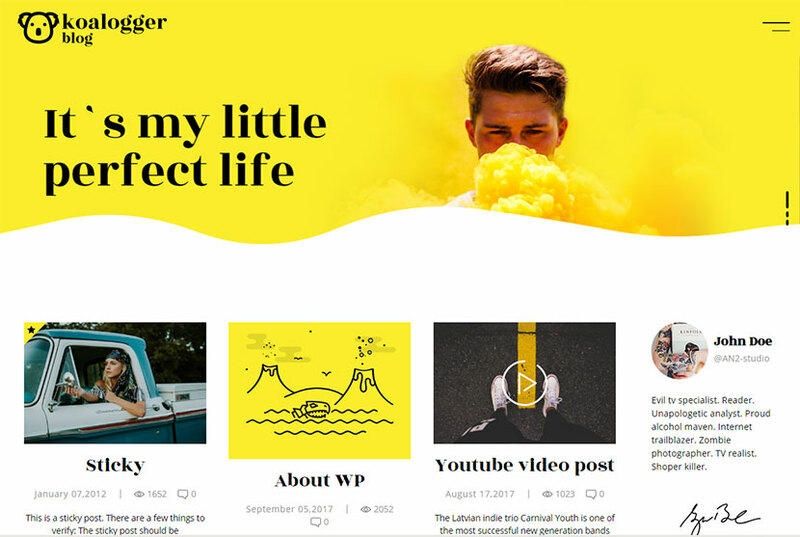 A simple and bright WordPress theme made for bloggers of any type. It comes with RTL support and allows to create a multilingual site in no time. Use it to ease your life and spend more time for writing good content and less time for customization. The theme is based on Codestar framework and can boast a great number of top-notch features as well as simple theme options. 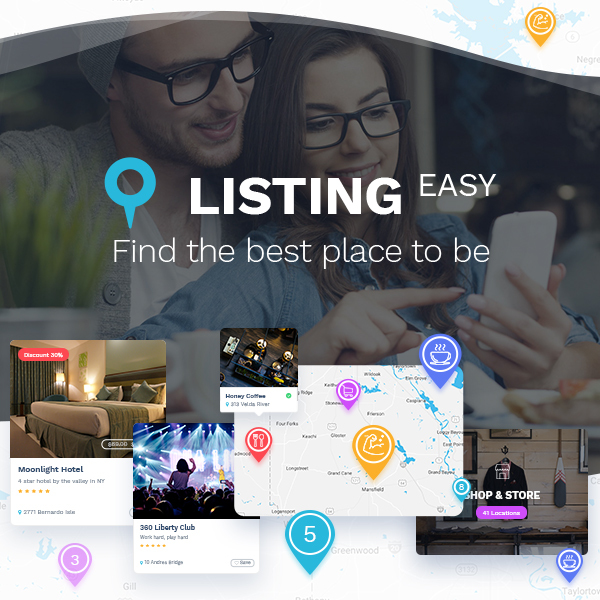 It comes with 3 post list layouts with different amount of columns, ajax load post, 6 post formats, a bunch of widgets, Contact Form 7, and more features. Be cool in blogging to make people pattern themselves on you and your style. Button UI ~ NIK Collection + Trainee Icons – Download New Freebie This Friday!